A symbol of love, beauty and strength, the rose is a perennial favourite as a decorative addition to any occasion. And these lovely favours, truly capture the essence of the rose. Each is 3.5" long and features a luminous crystal bud atop a chrome metal stem with embossed leaves. 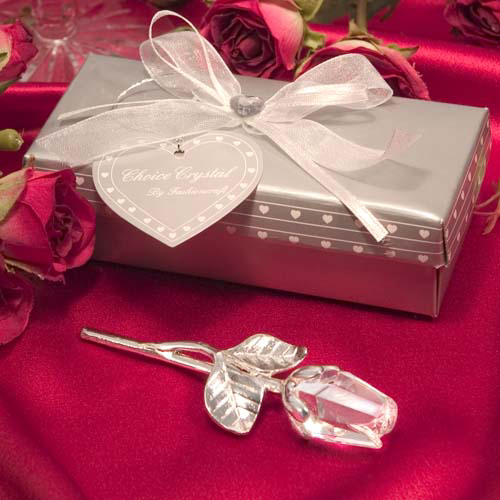 Surrounded by satin inside a Choice Crystal signature silver heart design box (4.25" x 1.875"), tied with an organza and satin bow with a crystal heart on top and an attached matching heart shaped tag. These favours make for a stunning presentation.